Nina Clark Ericson, Ph.D. loves the magic of Equus! 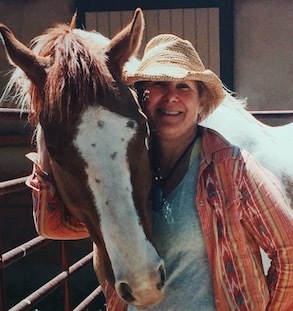 Equus Coaching combines her passion for helping people with her life-long love of horses. Nina partners with the horse, interpreting how the horse is mirroring the patterns and the energy the client is bringing into situations. She insightfully guides clients to transform internal roadblocks and lead more authentic lives, helping people thrive. She also helps executives develop more effective leadership skills. In addition to working with individuals, couples, and teens, Nina enjoys and is especially effective with executives and teams. Nina has her Ph.D. in Psychology, from the California School of Professional Psychology, and has twenty years of experience as a psychologist and as an executive coach.